"Picture this: you are a nerd," a guy in a Facebook T-shirt declares to a room of hackers munching on gourmet fried chicken. He looks around. "Oh, who am I kidding. We're all nerds." The small crowd of presumed nerds hardly acknowledges his joke, nodding in keen anticipation for the nerdy thing Guy in Facebook T-shirt is about to unveil. It turns out to be a chat room with the ability to place a group takeout order through simple text commands. It isn't pretty but it works like a charm. The crowd cheers, a gong is pounded and everyone swigs white wine and as the next presenter, a refrigerator sensor called iFridge, sets up. This is a food hackathon. 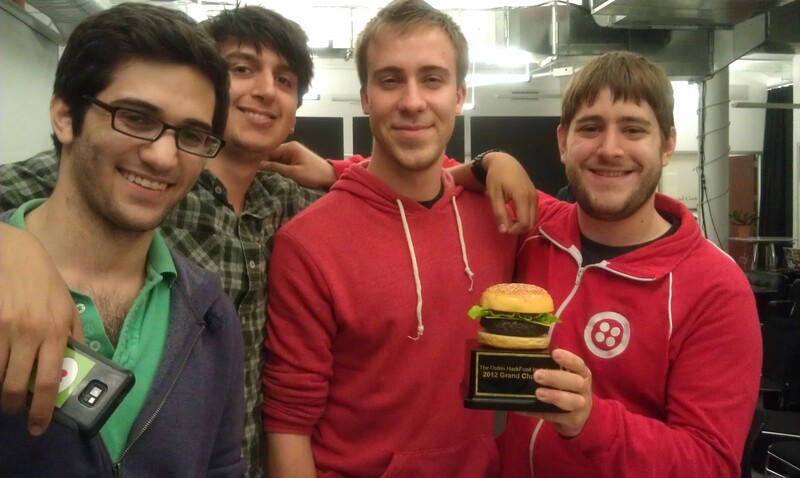 Sure hackathons for payment platforms, or social networks, or location-based apps can be fun. But this weekend I learned the best kind of hackathon satisfies our most basic need -- the need for sustenance. Ordr.in is a New york-based TechStars alum backed by Google Ventures. To celebrate its completely rebuilt developer portal and the expansion of its service to New York City, Boston and Philadelphia, the company hosted its first ever hackathon a Pivotal Labs in Union Square. An event of this nature can't get away with the standard pizza and Red Bull refreshments, so hackers gorged on made-to-order crepes and a catered dinner from Peels as they built tools around Ordr.in's ordering API. I left with a few takeaways (including from a stomach full of pie): Group ordering at the office is still a massive source of annoyance, and hardware startups always win hackathons. Ordr.in's API makes it simple for any app or website to include ordering functionality. The company makes money from restaurants implementing its services and there is a small of revenue share after the system is implemented. Ordr.in's API has become popular enough that three startups are launching in the fall built entirely with the platform, CEO David Bloom says. He calls the system "Twilio for food." The winner was a hardware app built with an Arduino controller and RFIDs called iFridge (nevermind that name has been taken). The app tracks what goes in and out of your fridge, counting calories, playing a celebratory song when you bust out the champagne, and alerting you when someone other than you removes a beer you've "locked" in the app. Several of the hacks aimed to solve the problem of group ordering lunch at the office --i t's a common point of angst, and how much can you really do with an ordering API? The answer, apparently, is a lot. The range of creativity managed to surprised me: Hackers built a subway stop-off app that identifies the best places to order takeout near subway stops on one's route home. There was an actually quite brilliant Taskrabbit-for-food-delivery system called Deliveryhop that I could see disrupting the entire delivery system used by restaurants. There was a gamified system of betting on what you think your office mates will order for lunch (and winning a dollar off your own if you're correct). The presentations were bookended by projects of food adorableness, courtesy of IsItCookieTime.com, built by Ordr.in's API architect, Ricky Robinett, and a bacon ice cream mascot by Pamela Castillo and Mike Caprio (pictured top left) named "Mr. Crave."